Hello! This week (May 25) we gave a class to 65 people on easy yet exoctic and delicious dips. While preparing for the class, I found out “hummus” is the Arabic word for chick pea (and Garbanzo is the Spanish equivalent). 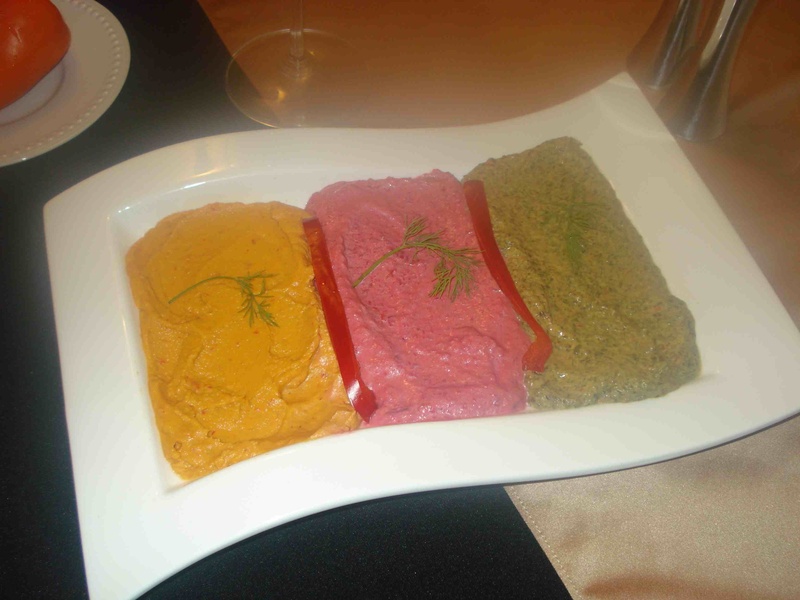 My first dip was the tri-colored hummus. You can really use any colored vegetable to make the tri-colors. I started with parsley, but I found that it didn’t turn the hummus green, it just gave the dip green flecks. So then I tried spinach. I was using an immersion blender, and it could be a food processor would have blended the dips better (but since I was doing 10-12 dips, I thought it would be easier clean up with the immersion blender). Spinach tasted good and looked good, so that went into the final dip. Dana F. gave me a great tip to use beets. I was shocked, I really thought it was going to be less than yummy and it turned out to be one of my favorites. I took equal parts of the hummus and the vegetable and blended them. I used canned beets, and emptied out the water. So, the dip was easy, good for you, and delicious. The third dip I picked was pumpkin – I used canned pumpkin for this as well and it turned a nice orange. However, I could have easily used roasted red peppers, or boiled carrots or a different squash. I thought the pumpkin gave a unique flavor. Puree the hummus and beets and put in a zip lock bag, do the same for the spinach hummus and the pumpkin hummus with lemon juice. Once all 3 dips are made, pipe them onto a plate so that each dip takes up a third of the plate and touches the other 2. Then jiggle the plate slightly to smooth out the dips (or you might have to use a spoon to smooth them out). Garnish with chick peas, or red pepper slices between the hummuses. I used a rectangular plate, but if you use a circular plate, you’ll make 3 wedges. This recipe is from Julie A. Roast a whole eggplant with the skin on. Then put into a plastic bag so as to make de-skinning easier. De-skin the eggplant while keeping the stem in tact (this keeps the eggplant together and looks nice). Cut the eggplant horizontally so that you can fan the eggplant out. On a serving plate put a very thin layer of tahini (only to cover the plate). Place and fan the eggplant onto the tahini, then drizzle the lemon juice, oil, garlic powder, salt and pepper on top. Then have your guests “construct” the baba ganoush when they spoon the dip onto their challah/cracker. I found out that aspargus is Greek for “shoot” or “stalk” (in case you were wondering – I bothered to look it up, so there you go). Any of the dips with tofutti can easily be dairy (just switch sour cream in for the tofutti). Did you know that Asparagi are *wrought* (when do I get to use that word?) with bugs. It’s true, take the asparagus and agitate it in a white bowl and chances are you will find some very little green colored bugs (aphids? not sure). Anyway, if you have asparagus that is bug free – go ahead and use the tops. However, mine had a lot of bugs, so I just cut off the tops. Cut off the tips of the asparagus. If usable – you can use these for garnish. Roast the asparagus. Then puree all ingredients. Ginger Carrots: from Naftali Q. Friends of ours (Heather and Eitan B.) made this delicious dip on Purim (which they served with their savory hamentashen). This is another surprisingly delicious dip. It tastes very refreshing and makes you feel like you are eating healthy (which you are). The ginger rounds out the flavors, so if you do not like ginger, just use a little, but use some. This is a great easy dip, since there is no cooking, just peel the carrots and blend. The original recipe called for rice vinegar, I didn’t have any in the house, if you have some, use that. I also didn’t have scallions in the house, so I just left that off (to be fair to myself, I got the recipe after I went shopping, and I didn’t have the energy to go out again). Blend all ingredients until no big chunks are left. 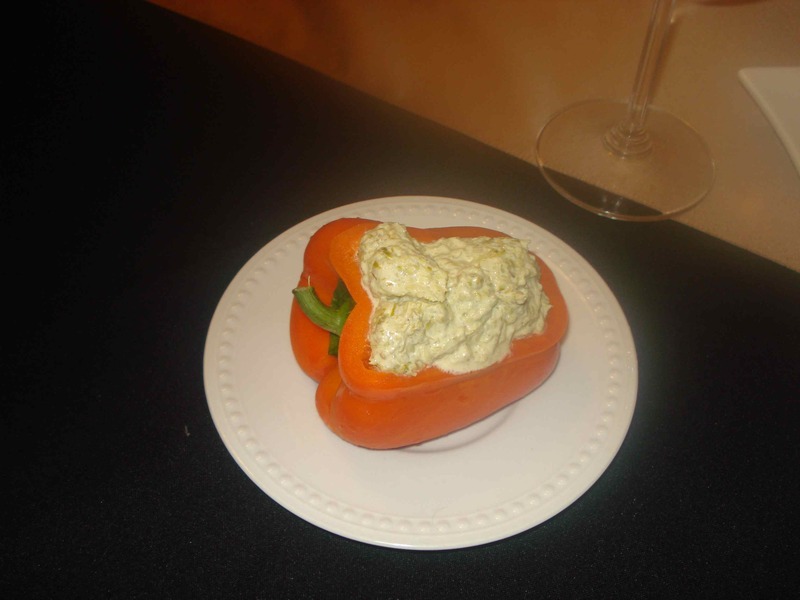 I suggest putting this dip into a zucchini “boat” – it looks very nice in a green serving dish. If I get my act together I will take pictures today of the dips. Bake or boil the carrots until soft and then puree. If you boil your carrots, *SAVE* your stock (and this goes for any time you boil vegetables). The vitamins/minerals go out into the water, so you might as well uyse them. You can use it for soup, or many recipes that call for water (especially meat dishes – it adds a layer of complexity). Intersting fact about beets: half the beets in the US are white and are made to harvested just to make sugar. Combine all ingredients in bowl and puree to desired texture. The tarragon adds a bit of sweetness to the dip. I used the can beets, – otherwise you can roast some beets with their skins on for an hour in a 350 oven. The following Moroccan dip is a little exotic. If you do not like cumin, cilantro or cardamom, you’re not going to like the dip – so leave out whatever spice you do not like. If you do not have cardamom and do not want to buy it (I found it at Whole Foods) you can use cinnamon instead. I found the cashews did not smooth out and gave the dip texture. If you prefer your dip smooth, then I would suggest using 1/4 cup of cashew butter. Combine all ingredients and puree until desired texture. Squeeze out any extra liquid. Then puree until desired texture. If it is too liquid-y, you can reduce the dip on the stove. I was told by a woman at the class this dip would be good when combined with either Tofutti sour cream or regular sour cream. Mix all ingredients until smooth. Yum. This is a great article on dips. I never thought there was so much information on dips. Thank you sweet and good catering for such great information on dips. Looking forward to more in the future. Seeing all these new and different dips lets me know there are a lot of dippy people around. Hey Sweet & Good! Thanks for sharing the wealth. Though I am not a gourmet, its nice to know that I can now pretend I am on occasion! The spinach chumus dip was a real winner in our house! Hooray, I’m so glad you liked it. I felt as if I was at another family shower and you were demonstrating everything. Looks great, can’t wait to try.